Grapefruit (named that because it grows in clusters like grapes) is packed with vitamin C but it contains several phytochemicals as well: flavonoids, limonoids which have been shown to reduce skin cancer risk, beta-carotene and lycopene (in the pink and red fruits). Its antioxidants improve skin tone. Avocado contains rich, healthy saturated fats. Its glutamine removes toxins and impurities from your skin. Pour sugar into a glass bowl and juice the grapefruit into it. Add avocado oil and fold to combine–vigorous stirring will dissolve the sugar and you want to retain the granules for scrubbing. Kiwi is beautiful and can make your skin beautiful, too! 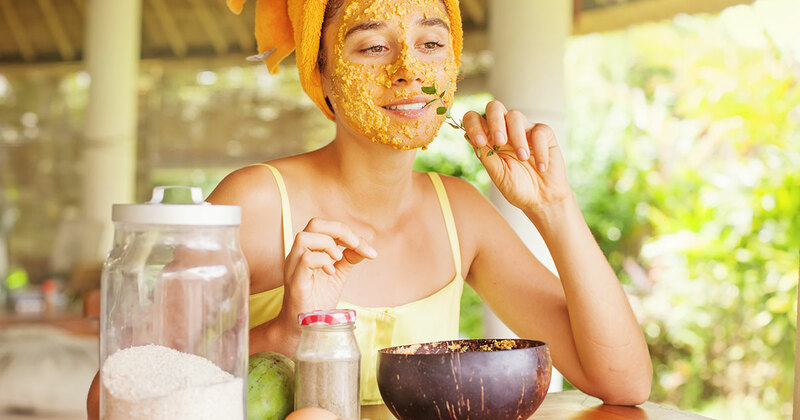 Vitamins C and E, omega-3 fatty acids, plus other antioxidants feed your skin. Safflower oil calms irritation and moisturizes. Peppermint fights blemishes, cools the skin, and calms the mind. Peel and slice kiwi. Put in a glass bowl and mash with a fork. Add sea salt and mint. Mash and mix until well blended. Add oil gradually as you mix until you reach the desired consistency of a thin paste. Olive oil moisturizes, smoothes, and softens, healing free radicals with its antioxidants. It has been noted for anti-aging effects in the skin. Honey is simply amazing. It is an antibacterial and moisturizer that can heal acne without harming healthy skin. Brown sugar removes dirt and unclogs pores without stripping skin of its natural oils. Lemon juice contains vitamin C and is a natural bleach which can help adjust discolored areas of the skin. It adds a little zip that refreshes as well. Whisk together all the liquid ingredients until well blended. Add sugar and mix with a spoon. You can add more or less sugar depending on the desired consistency–it should be a thick paste.